The Origins counter at Boots really excited me when I asked the lady at the counter if its natural and she replied yes. So I bought a few products although the colour matches were not the best. It is a fairly natural make-up brand but not 100%. I say fairly, as they do not use many of the most popular and well known nasties like parabens and phthalates, but they still use ingredients like BHT, methylparaben's (in some) and lemonene. 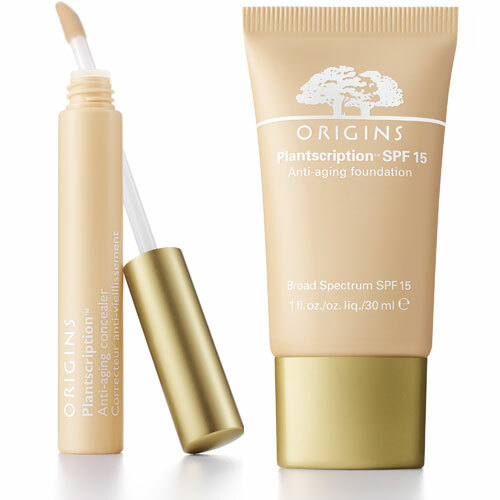 Im NC44 in foundation colour, and can get away with NC42 for concealer for under eye highlighting in Mac terminology and there is no perfect colour match in the Origins range for my skin colour especially for my yellow tones. I also have Oily acneic skin but have suggested my views based on my mums mature normal skin and my sisters combination skin type. The concealer mentioned above has a neutral pinky tone. If you have a neutral tone then it may work for you but definitely not for the more yellow tones. It feels luxurious but it glides to a sheer finish so it does not cover enough but its perfect for those wanting a sheer glossy finish. It doesn't look cakey and it would look flawless on mature skin however on skin that is prone to oil may find it to go in the under eye lines so setting it would be ideal. It gives a highlighted gloss finish but not a product I would use again simply because of the colour and I require more coverage. Its a concealer for those that do not require any concealing!It claims to 'float over skin without creasing caking or sticking' which my sister with combination skin does agree but for me with oily skin it went in my creases. With only 12 shades I was not hopeful! I was in between 'Medium Deep Warm 09' and 'Medium Warm 08'. We opted for 'Medium Deep Warm' instead as the medium warm was looking slightly ashy on my hand. Priced at £29.50 for 30ml bottle of a very liquidy foundation that does not cover enough doesn't appeal to me. The foundation alone without any powder looked quite greasy on me eventually and I did have creasing, this might be because its an anti-aging foundation however so would be better for mature skin types. My mum who has a darker skin tone, the foundation was perfect for her as tt brightened up her skin due to the deep orange tones, moisturised and made her skin look dewy and younger. So all in all if you have dry skin maybe even normal and mature skin and do not need a heavy coverage then this foundation is for you. THE BEST natural mascara I have ever tried. If you like thick, separated, voluminous, long lashes, and like to build it up as the day goes, then this is the mascara for you. It will not disappoint Its designed to make your eyes look brighter and bigger. I'm not sure about brighter but the latter is definitely correct. As its a very waxy mascara, it goes on softly on each lash, giving a natural feel, and with more applications its darker and more intense. Perfect for evenings too! I think it can even compete against the most popular non-natural mascaras! Now I do not have wrinkles, but I purely use an eye cream to provide extra moisturisation to my eye area. I do not feel using just a day cream or lotion is enough. This cream is amazing! almost feels like a treat to use it every morning or when you need a slight pick me up for those puffy eyes. The smell and colour of this cream is beautiful, it smells like oranges or flowers, and its a peachy orangey colour. But the real magic comes when you put it on. Under the eyes it illuminates the skin giving it a iridescent glow! almost acting like a concealer, hiding your bags and puffy eyes. And over a few hours it does de-puff your eyes and provide relief, making them feel more refreshed. I love this eye cream, I almost feel as if its makeup, and makes my bare skin look more beautiful. It makes me want to try more of the GinZing range and try the GinZing Moisturiser that claims to boost radiance. After trying this eye cream I hardly doubt the claims are false! However £23 for a 50ml jar for the moisturiser and £23 for a 15ml eye cream would be stretching my student budget way too far. For now I'll just stick with the eye cream!